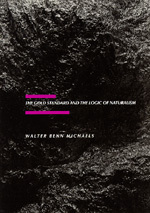 The Gold Standard and the Logic of Naturalism discusses ways of creating value in turn-of-the-century American capitalism. Focusing on such topics as the alienation of property, the invention of masochism, and the battle over free silver, it examines the participation of cultural forms in these phenomena. It imagines a literary history that must at the same time be social, economic, and legal; and it imagines a literature that, to be understood at all, must be understood both as a producer and a product of market capitalism. Walter Benn Michaels teaches English at Johns Hopkins University.